Barking Rabbits: So Rand Paul thinks that accidents just happen all by themselves? So Rand Paul thinks that accidents just happen all by themselves? Here is a recent quote from Mr. Paul on the ongoing BP-caused ecological disaster. I cannot begin to explain how many misguided notions and outright lunacy those few sentences contain. And to think that this is from who will probably be a U.S. senator by the end of the year is absolutely frightening. But let’s talk about that bit about accidents “happening.” Paul’s quote makes it sound as if accidents don’t have a cause. They sometimes just appear for no reason and are totally unexpected. This is absolutely incorrect, and this is a very ridiculous thing to say about very complex, man-made technology. This happens to be an area that I know something about. Since the beginning of the 20th Century, there has been a study of industrial accidents -- why they occur and what can be done to prevent them. If you put in the correct search words, you can find all sorts of books on Amazon that talks about accidents and their causes. This is a very specialized field of study done by a number of very dedicated and intelligent people. Accidents do not just “happen.” There are causes, usually multiple ones, for every serious industrial accident. The response of our society has been to mandate certain safeguards and minimum acceptable safety standards by the Code of Federal Regulations. Every important and potentially hazardous industry in this country is regulated in this manner – aviation, railroads, finance, drugs, mining, nuclear power… The list goes on and on. We do this for the common good of the American people. In 2009, the company, Massey Energy, was fined a total of $382,000 for "serious" unrepentant violations for lacking ventilation and proper equipment plans as well as failing to utilize its safety plan properly. In the previous month, the authorities cited the mine for 57 safety infractions. The mine received two citations the day before the explosion and in the last five years has been cited for 1,342 safety violations. The CEO of Massey Energy, Don Blankenship, has received criticism for his apparent disregard of safety. Accidents do not “just happen.” There are causes. They might be from heretofore unknown or truly unexpected causes, but there are causes. 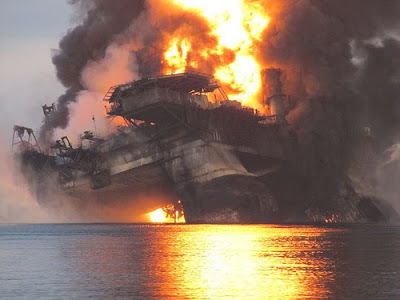 In the case of the catastrophic explosion about the Deep Horizon oil drilling rig and subsequent oil release from the bottom of the sea floor, it appears that many regulations were not complied with and many warning signs were ignored. Yet, BP and Transocean pressed ahead. The most important considerations were schedule and cost. This is the thinking that has given us the worst ecological disaster in American history, which no one knows how to fix. Even if these geniuses figure out how to stop the huge flow of oil into the Gulf of Mexico today, we will still be faced with decades of the effects of the oil that is already there. This thinking gave us the worst financial meltdown this country has seen since the Great Depression. This thinking gave us twenty nine dead miners in West Virginia. Accidents occur for reasons, and regulations have been put in place to reduce the likelihood of something going terribly wrong because of the reasons that we know about. Willfully ignoring these regulations in the chase for ever-expanding profits for people who are already rich is obscene. The corporations in this country, along with the government agencies that are tasked with oversight, need a drastic change of focus and purpose. Regulations are not evil. Accidents do not “just happen.” Unfortunately, I believe that this country is too far gone. Huge corporations are too voracious, too powerful, too willing to do whatever it takes to retain and expand their profits. Following rules are for little people.